Marriage is a promise you make each day of your life. Celebrate your love today, share your dreams tommorrow and cherish happy memories always! Each love story is beautiful. Happy marital life! Marriage is a promise for each other to guide and protect. All the best in the times that lie ahead! You suit each other perfectly! Congratulations! May your everyday together be a joyous ride. Let everything you have today never end. Always find beauty in one another and let the love and laughter live forever! 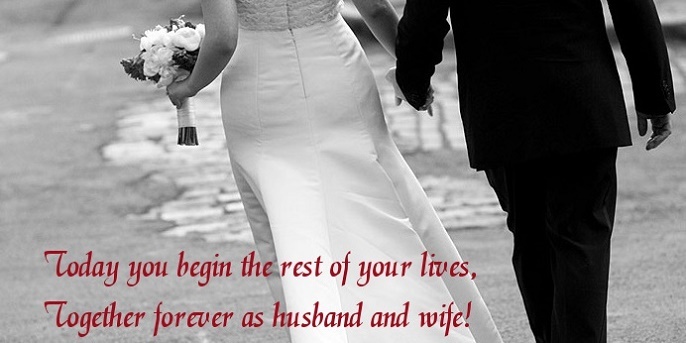 Marriage formed in Heaven begins right here on Earth. On this beautiful and lovely occasion I wish you a bright future together! Congrats on your marriage and all the best for your future together. Enjoy every moment of your love life. And ended it as a man and wife! Let you never once pause to measure your love and always find magic in each other's hands! Congratulations on your marriage! A romantic journey begins with marriage. Congratulations on your wedding and best wishes always! Today is going to be a day that you will never forget. Enjoy the bliss of becoming one. May marriage bring you great joy, love and passion in your life.